“Yes, it’s true that no single event makes a trend,” said Obama. “But the fact is, the 12 hottest years on record have all come in the last 15. Heat waves, droughts, wildfires, and floods – all are now more frequent and intense. We can choose to believe that Superstorm Sandy, and the most severe drought in decades, and the worst wildfires some states have ever seen were all just a freak coincidence. Or we can choose to believe in the overwhelming judgment of science – and act before it’s too late,” continued the president. “In 1992, in Rio De Janeiro, Brazil, countries joined an international treaty, the United Nations Framework Convention on Climate Change (UNFCCC), to cooperatively consider what they could do to limit average global temperature increases and the resulting climate change, and to cope with whatever impacts were, by then, inevitable,” reads a UNFCCC report. By 1995, countries realized that emission-reductions provisions in the Convention were inadequate. The first Conference of the Parties (COP 1) takes place in Berlin, Germany to strengthen the international response to global warming. The Kyoto Protocol, adopted in 1997, legally binds developed countries to emission-reduction targets – the first commitment period started in 2008 and ended in 2012. The US reduction target was 7%. In February, 2002, Bush 43 announced a US plan to voluntarily reduce the “GHG intensity” (ratio of emissions to economic output) of the US economy by 18% over the following 10 years. In 2007, “Climate science entered into popular consciousness,” according to a UNFCCC report. I first began to track UN-backed climate-change initiatives, in 2005, as special reports editor at The Hill newspaper, which intensified, in 2008, as an executive and Morning Brief editor at Clean Skies/Energy NOW! TV. While at Clean Skies/EnergyNOW! TV, I was privileged to co-produce daily radio and television reports, generated by our team coverage of the December 2009 COP 15 UN Climate Talks in Copenhagen, Denmark, and managed a congressional op-ed platform for political debate. Rep. Michael Honda (D-CA), a member of the House Sustainable Energy and Environment Coalition, wrote an op-ed for us about the US engagement at COP15 – which coincided with the end of President Barack Obama’s first year in office. “As Copenhagen’s [COP15] climate talks conclude, we in Washington must not wait any longer to lead. With the White House recently committing to emissions cuts of 17% by 2020 (from 2005 levels), 30% by 2025, 42% by 2030 and 83% by 2050, President [Barack] Obama is recognizing the uniqueness of this moment, making an important appearance in Copenhagen, setting the precedent for American support and leadership,” wrote Honda in 2009. The Washington Post’s Brad Plummer, in 2012, rather succinctly laid out “what President Obama [since COP 15] has — and has not — done on climate change: Over the past four years, climate has largely taken a backseat to the economy, health care, and financial regulations. But the Obama administration has taken a few modest steps to curb carbon emissions,” wrote Plummer. “The Environmental Protection Agency has crafted carbon regulations for power plants, making it difficult to build new coal plants in the United States. The administration has tightened fuel-economy standards for cars and light trucks, reaching 54.5 miles per gallon by 2025. And the stimulus poured $90 billion into clean energy, which, for all its shortcomings, did boost U.S. solar and wind capacity significantly,” he continued. “But Obama has also been fairly cautious on climate issues: The White House endorsed, but didn’t push very hard for, a carbon cap-and-trade bill when it was struggling in the Senate in 2010,” Plummer added in 2012. Also, in 2010, world governments agreed that emissions need to be reduced so that global temperature increases are limited to below 2 degrees Celsius. At COP17 in Durban, South Africa in 2011, governments of the Parties to the Kyoto Protocol decided that a second commitment period, from 2013 forward was in order. “The first commitment period under the Kyoto Protocol comes to an end in 2012, and the negotiations under the UNFCCC have yet to reach an “agreed outcome” to regulate greenhouse gas emissions post-2012. This impasse raises the prospect that in a year’s time – even as the scientific evidence mounts that human impact on the climate system is veering out of control – there will be no internationally agreed legally binding commitments regulating greenhouse gas emissions,” wrote Jacob Werksman of the World Resources Institute in November 2011. Through three October 2012 nationally televised presidential debates, with total audience impressions of hundreds of millions, not one section was dedicated to asking the would-be and sitting leader of the free world about their plans to address global warming. 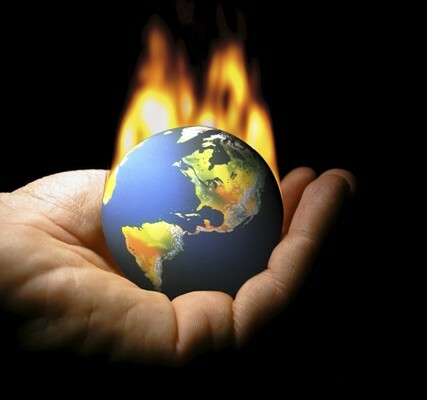 In the 2012 Republican platform, there is no per se plank on global warming. At the GOP nominating convention, in August 2012, in his acceptance speech, Governor Mitt Romney joked about climate change, “President Obama promised to slow the rise of the oceans and to heal the planet. My promise … is to help you and your family,” said Romney to a chorus of cheers. At the Democratic National Convention, in September 2012, Obama responded to Romney’s dig: “And yes, my plan will continue to reduce the carbon pollution that is heating our planet because climate change is not a hoax. More droughts and floods and wildfires are not a joke. They’re a threat to our children’s future. And in this election, you can do something about it,” said Obama to a chorus of cheers. Informal UN Climate Talks also convened in early September in Bangkok, China, with the UNFCCC citing “concrete progress on key issues across all three negotiating groups [Ad Hoc Working Groups on: Further Commitments for Annex I…, Long Term…, Durban Platform…], setting a firmer base for decisions that will be made at the UN Climate Change Conference [COP18]…,” written in a UNFCCC press release. Some would argue (perhaps cynically) that the optics of Hurricane Sandy’s impact on the Atlantic eastern seaboard, in November 2012, and the subsequent optics of the bi-partisan, disaster-relief related embracement of New Jersey Governor Chris Christie (R) and President Obama, in the closing days of the 2012 presidential campaign, gave the Obama campaign a final surge to a more impressive electoral victory. Just a few weeks after President Obama’s re-election, fully twenty years after the current UN framework to address climate change commenced, the US and 190 other countries convened with low expectations, in late November 2012, at COP18 in oil-rich Doha, Qatar. Todd D. Stern, the US State Department’s special envoy for climate change, has been the government’s chief negotiator at UN climate talks since 2009. “This year was understood as a year of conceptual thinking about what the shape of the 2020s ought to be,” said Todd in New York Times interview. The Kyoto Protocol was extended 8 years at COP 18 to 2020. But the agreement was severely weakened by the withdrawal of Russia, Japan and Canada, so its signatories now account for only 15 percent of all global emissions. A report released just prior to COP18, in November 2012, by the UN Environment Program said nations’ pledges were already too weak and greenhouse gas emissions were increasing at a rate that put the world at risk without immediate action. “Partial loss of ice sheets on polar land could imply meters of sea-level rise, major changes in coastlines and inundation of low lying areas, with greatest effects in river deltas and low-lying islands,” said Rajendra Pachauri, chairman of the Intergovernmental Panel on Climate Change (IPCC) – the science advisory group to the UN – to delegates in Doha. With regard to achieving a universally binding agreement on climate change “Time is running out,” said the UNFCC executive secretary, Christiana Figueres, at a COP 18 news conference in Doha. “The door is closing fast on us because the pace and the scale of action is simply not yet where it must be,” she added. “Evidence suggests that for most of the past 3,000 years, sea levels were stable, but that they began rising in the 1950s. Since then, they crept up at an annual rate of 1.7 millimeters per year. Lately, though, sea level rise has apparently been accelerating: This 2010 paper published by Science magazine (pay walled), notes that over the past 20 years, global sea level has risen an average of 3.3 millimeters a year,” wrote science writer John McQuaid for Forbes in August 2012. In his first post-2012-election press conference, in November, the economy and the politics surrounding it were understandably still foremost on the president’s mind, but climate change was addressed. “I don’t know what – what either Democrats or Republicans are prepared to do at this point, because, you know, this is one of those issues that’s not just a partisan issue. I also think there’s – there are regional differences,” said the president. “There’s no doubt that for us to take on climate change in a serious way would involve making some tough political choices, and you know, understandably, I think the American people right now have been so focused and will continue to be focused on our economy and jobs and growth that, you know, if the message is somehow we’re going to ignore jobs and growth simply to address climate change, I don’t think anybody’s going to go for that. I won’t go for that,” he added. “If, on the other hand, we can shape an agenda that says we can create jobs, advance growth and make a serious dent in climate change and be an international leader, I think that’s something that the American people would support,” said Obama. Fast forward, two months, to the president’s 2013 the State of the Union, “If Congress won’t act soon to protect future generations, I will,” Obama said. “I will direct my Cabinet to come up with executive actions we can take, now and in the future, to reduce pollution, prepare our communities for the consequences of climate change, and speed the transition to more sustainable sources of energy,” said Obama. “To continue the significant progress we have made in cleaning up the environment, I recommend a $153 million increase for the Environmental Protection Agency’s regulatory, research and enforcement programs. I also recommend an increase of $315 million for the Superfund hazardous waste clean-up program in order to maintain the program’s momentum and support a stronger enforcement role. There was no mention of the Environmental Protection Agency in President Obama’s 2013 State of the Union Address. Aside | This entry was posted in Politics and tagged AP, Barack Obama, Bill Clinton, Brad Plummer, Christiana Figueres, Clean SKies TV, climate change, COP 18, COP!, COP15, COP17, Copenhagen Climate Talks, Democratic Convention, Democratic Platform, Doha Climate Talks, Durban Climate Talks, Election 2008, Election 2012, Energy, Energy NOW! tv, Environment, EPA, Fossil Fuels, George Bush, GHG, global warming, GOP Convention, GOP Platform, greeghouse gases, Hillary Clinton, Hydraulic Fracturing, Hydrofracking, IPCC Rajendra Pachauri, John McQuaid, Kyoto Protocol, Mike Honda, Mitt Romney, Natural Gas, Oil, Petroleum, Ronald Reason, State Department, State of the Union, The Hill newspaper, Todd D. Stern, UN Climate Tals, UNFCCC, Washington Post. Bookmark the permalink. I did like your photo! Thanks for writing! …And when I have more time, I’ll come back and look at more. Rushing now, I have to leave and pick up a child. But chose to bookmark your photo a dam for later review. Not sure why that would be off-putting to anyone. Again, take care. I’ll explain. I have hundreds of people join my blog each week. Most of them without ever even looking at the content of my pages. Many of these people join every blog that comes across their radar; perhaps with hopes that some of these people will reciprocate. Or, many times people will “like” every blog within a certain category of their reader. They do so whether or not they really discovered anything remarkable about the post. This has become a sore subject for me and many others, and, unfortunately, I unleashed on you. I apologize. And I really am sorry. Of course, my frustration was further fueled by some of the content of your website. Politically, you and I are at strong odds. Still, that’s no excuse. I’m usually a pretty reasonable guy. Thus the title of my literary blog, “The Flight of Reason”. Lol. Geez. I understand — I have a pet peeve or two myself — and welcome you into the fold and really do like your pictures (smile)! I’ve been asserting for years now that the problem of climate change is too big for the current geopolitical structure. Short-sided self-interest, and the growing power of multinational corporations, are intransigent obstacles to mitigating global warming at this point in time. The only short-term solution is a massive and costly public information campaign. The long-term solution is self-evident: People will change only when the situation gets out of control. But by then, it will be too late. The problem with acting on Global Warming, Climate Change, or whatever it is we should call it these days is there is no proof that a problem exists. When we produce carbon dioxide, the excess is absorbed into the ocean for carbonaceous rocks, that is, limestone. Climate changes. That’s just the way it is. When Eric the Red visited Greenland, he found a green land. That’s how it got the name. Now it is too cold for anyone to call it that except in jest. If we are to believe the people who study rock strata, sea levels have gone up and they have gone down. We have had ice ages, and we have had warm periods of tropical weather. Yet we do not know what caused either one. So why are we suppose to get excited about climate change? I don’t think it is because we caused it. I think it is because we cannot do anything to stop it, and we need to be prepared weather that does not agree with our plans. So glad you shared that, CT, it is a reasoned approach. I have often considered the cyclical aspect of things. Deep core samples, from either pole indicate, dating back many “ages”, that the concentrations of carbon of our age far exceeds that of any extinct age–is that as a result of indistrialization and is that impactful? Fair questions, I think. While working at the American Institute of Physics, we did some start up campaign work for a Mantle Quest outfit, who partnered with Japan and want to do some deep drilling to the earth’s mantle, via the ocean. That should yield interesting research results as well. Take care and you will no doubt remain a thinker Thanks for reading and writing!. Contrary to popular opinion, the global warming effects of atmospheric greenhouse gases is established science first proposed by Joseph Fourier in 1824 and investigated quantitatively by Svante Arrhenius in 1896 (http://www.aip.org/history/climate/co2.htm). Aside from random events such as volcanic eruptions and impacts from meteorites, science understands the cyclical processes that affect Earth’s climate (see http://en.wikipedia.org/wiki/Milankovitch_cycles and http://en.wikipedia.org/wiki/Solar_variation). These factors indicate we should be in a cooling trend. Since the planet is getting warmer, the cause lays elsewhere. Carbon dioxide, the greatest contributor to global warming, is currently at the highest atmospheric level in the last 650,000 years (http://climate.nasa.gov/evidence/). Most of the recent increase is anthropogenic (man-made). The arctic ice cap is melting at an alarming rate (http://www.forbes.com/sites/alexknapp/2013/02/17/arctic-ice-melt-is-accelerating-even-in-fall-and-winter/), and it could be ice-free in summer within a decade. The last time in history when the arctic was likely ice-free in summer was 125,000 years ago (http://nsidc.org/arcticseaicenews/faq/). The scientific consensus on climate change is overwhelming (http://climate.nasa.gov/scientific-consensus). It’s past time we stop fooling ourselves. So glad you opted to weigh in with documents we can research. Nicely done and I’ll will do my due diligence, thereunto. Thanks!! !